My garden isn’t growing quite as well as it did last year. So far the corn and the squash plants have died; the parsley and chervil have sprouted but are still very small, and I’m sure that by this time last year my courgette plants were bigger than they currently are. On the bright side, I’m going to have lots and lots of raspberries, strawberries and blueberries this summer; my broadbeans and french beans (neither of which grew at all last year) are well established and my fruit trees are heavily laden with tiny plums and apples. 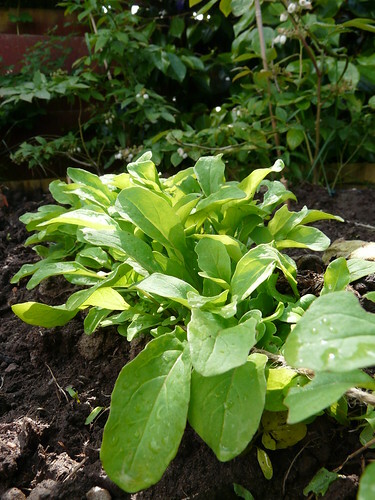 Plus, I definitely will not be stuck for salad leaves this year as lettuce, sorrel, spinach and rocket are all growing happily and abundantly. Though the latter leaf could do with another week to reach full maturity, I couldn’t help but pick a small bunch of baby leaves for this simple salad. The idea comes from Anna Del Conte’s Amaretto, Apple Cake and Artichokes. She recommends popping each chickpea out of it’s papery casing and makes a dressing out of warmed olive oil and briefly sautéed garlic. Lazy bugger that I am, I left the chickpeas as they were and whisked together a lemony dressing instead. No matter, it was nutty and fresh and delicious. Whisk together the dressing ingredients. Taste and add more lemon juice or oil if required. Gently combine the rocket and chickpeas. Sprinkle over the dressing and, again, gently combine until the dressing lightly covers both ingredients. This is my entry for this month’s No Croutons Required event. Gorgeous simplicity Wendy. My salad leaves have only just started sprouting so you are way ahead! Simple salads like this are always the best. I too am having problems with my veg this year, especially my tomatoes!! This sounds good Wendy and I am eating tons of chickpeas just now, so it is just perfect. I bet that dressing was tangily tasty! This sounds like a wonderful, simple salad! Helen – I need to plant more nor or else they’ll all run out at the same time and I’ll be grumpy! Beth – I had problems with tomatoes last year and haven’t got round to planting them this year. Hope yours come good! Chickpeas are my favorite legume. Such an elegant little salad this is. Thanks for participating in our event. 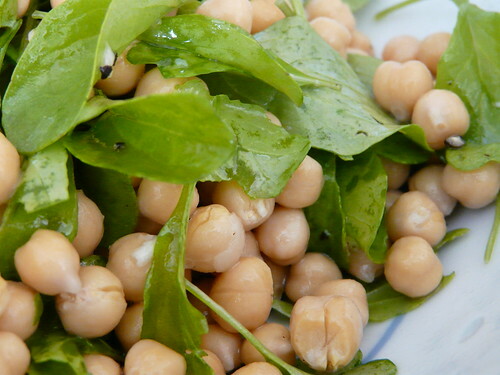 LOVE Rocket and chickpeas. MUST try this recipe. Is it really this simple? What a lovely little salad. Most appealing. Slipping chickpeas out of their skins is something I keep for those Zen moments when it is about being present while doing the mundane things but in reality I only bother doing it for hommos – it really makes it much smoother when you blend them. Lisa – You’re very welcome! Mallika – Seriously this easy. It’s very simple and clean tasting and I adore it. Another Outspoken Female – Will have to remember that next time I make hummus. I’ve never been very happy with my own efforts. Johanna – Thank you. My garden is getting there. Feels a bit like baking in someways. When things go right, I’m never very sure why! Life is clearly too short to skin a chickpea and this looks lovely just as it is! Was very excited to find my first strawberries on return from a wedding at the weekend. Decided to leave them on for one more day until they were just a touch riper though. BIG mistake. Today I went to pick them and let’s just say that the birds got there first. Booo. Chickpeas are a definite yes for me. I just don’t know why I can’t warm up to rocket. Simple, yummy, and good for you–this looks like a great salad. The heat has me eating salads for lunch lately. Unfortunately, I’m running out of salad greens that can handle the heart. Even the farmers’ market is short on salad greens. Darn it! I’m so excited that you’ll be getting lots of fruit from your garden. That is wonderful! Antonia – The slugs got most of mine last year. Bought pellets this year. Didn’t even think about birds though. Gah! Giz – And life’s too short to eat things you don’t like! Watercress would work well too, I reckon. Christina – I’m particularly excited about the plums for some reason. It’s fun getting up in the morning and picking one fresh from the tree, you know? have a good day darling! JennDZ – Oh dear! Hope they grow soon! Silvia Magnolia – I love them too. 🙂 Enjoy your day! I have no garden this year…I’m so sad. And, as if in sympathy, I have no fruit on the fruit trees… It must have been that late frost, but they are all bare! I saw your recipe from the round up. Sounds delicious. Oh, I’m so sorry to hear about the squash and corn, Wendy. Of course, in my book, fresh berries make up for a lot. I love this light and refreshing dish too. I made a pasta the other night with chickpeas, rocket, and cherry tomatoes. Ah, a perfectly balanced, simple and healthy salad. I can imagine the bitter rocket and nutty creamy chickpeas are great foils for each other. Susan – They work tremendously well. Can see this being eaten frequently over the summer. Hello I’m Scottish and really like your website. I am trying to lose weight and go to weightwatchers. Ireally like your recipes as they are low in fat , just found your site today and will use the recipes soon. I also have a garden so it is good to share ideas and recipes. Have you tried chickpeas with an onion fried with some herbs then add a spoonful or two of peanut butter then a tin ot two of chopped tomatoes add a sprinkling of cinnamon and simmer for ten minutes. Its great.